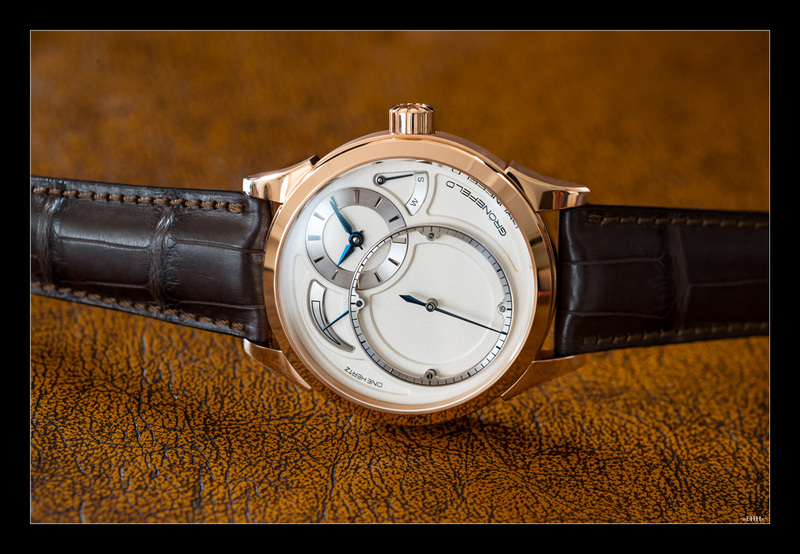 Dutch Independent Haute Horlogerie watch brand Grönefeld have created the GTM-06 and several versions of their award-winning One Hertz, that has put the dead beat seconds complication back on the horological map. 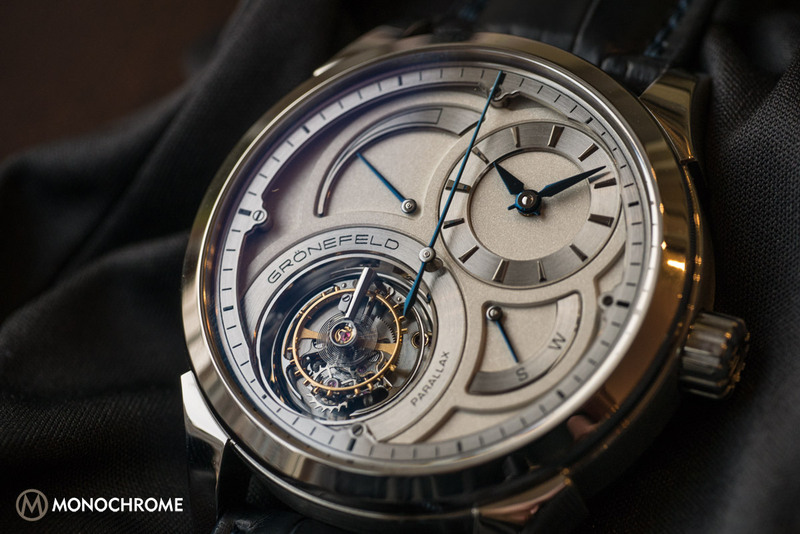 Today we’re introducing their newest creation, the Grönefeld Parallax Tourbillon, featuring a magnificently finished and exposed flying tourbillon. 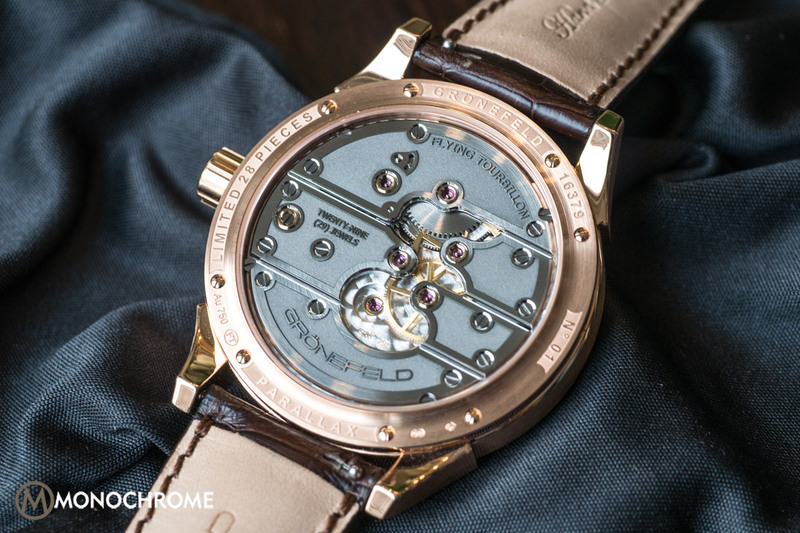 The Grönefeld Parallax comes in a red gold version, limited to 28 pieces, and a stainless steel version, dubbed “1912”, which is limited to 12 pieces. 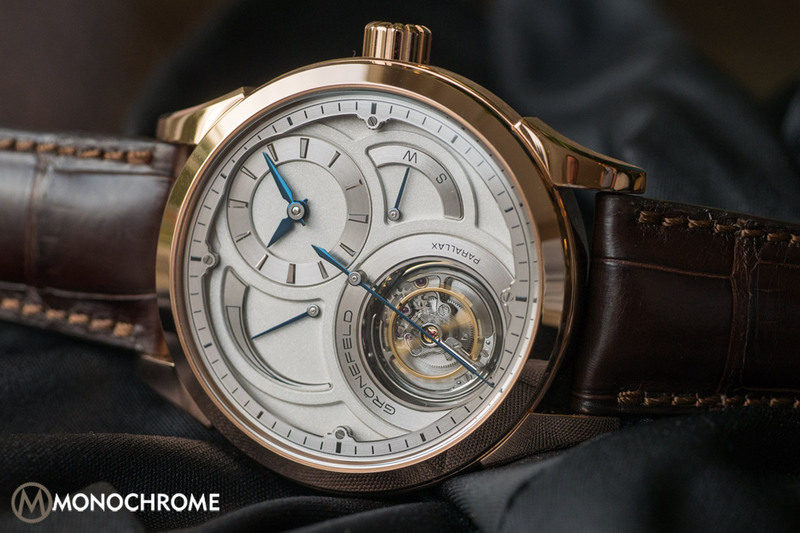 The in-house developed movement features a stop-seconds mechanism for precise adjustment, a winding/setting selector, a power reserve indicator and a flying tourbillon that rotates perfectly in sync with the central seconds hand. 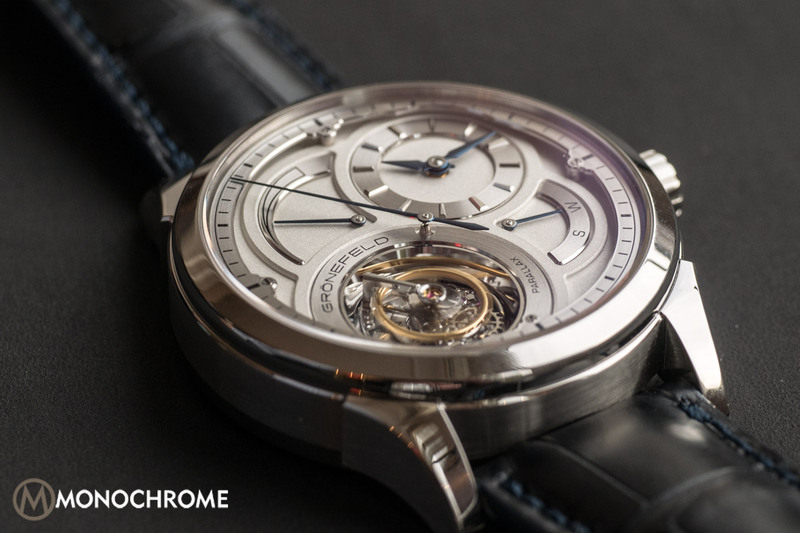 The tourbillon is highlighted by raising it out of the movement and above the dial, and it is surrounded by highly polished steel that almost works as a mirror, so the tourbillon escapement catches more light. 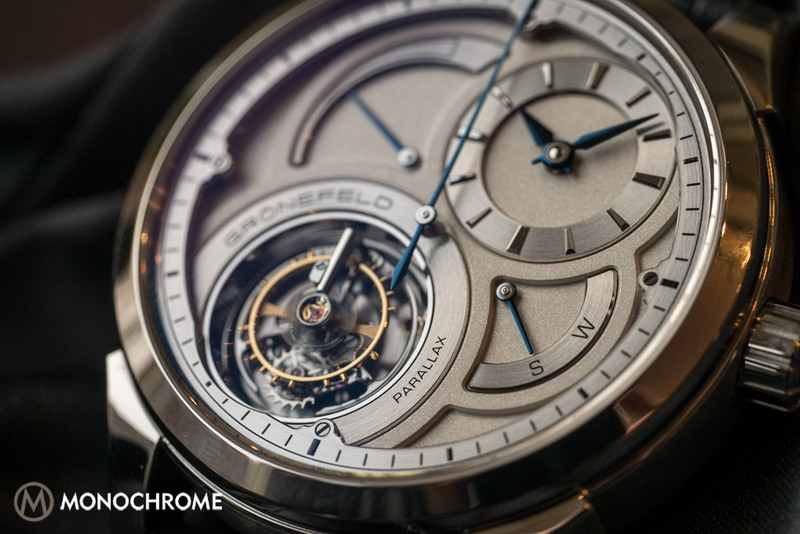 Above the tourbillon is the power reserve indicator that indicates how much of the 72 hours of autonomy is left. 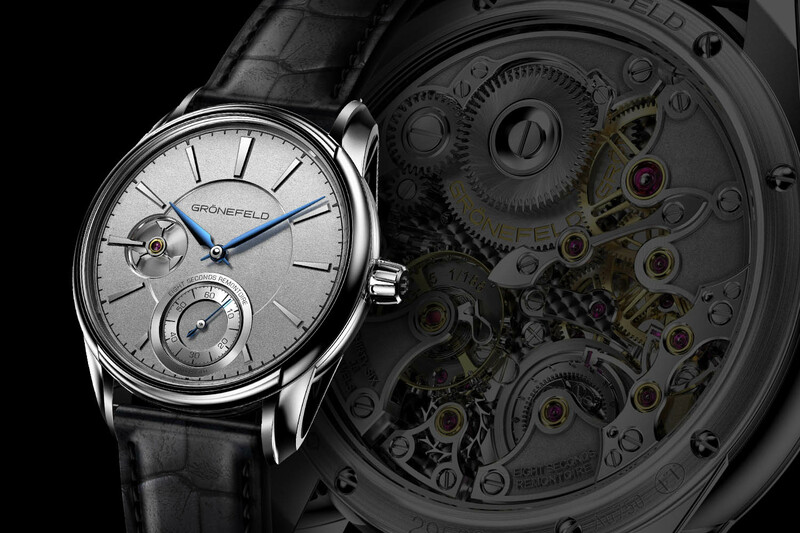 New for Grönefeld and now first shown on the Parallax, are flame-blued steel hands, which contrast very nicely against the solid Sterling Silver 925 dial with a frosted surface. 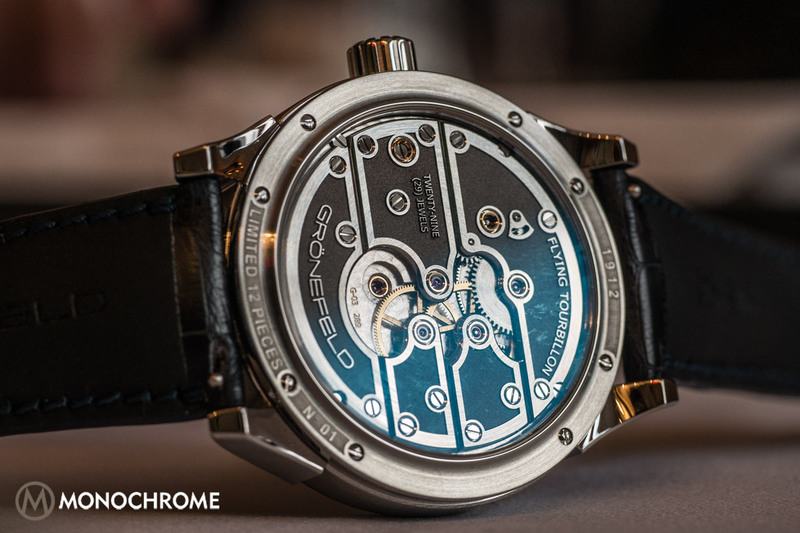 To the right of that is the hours/minutes sub dial, also with flame-blued steel hands. 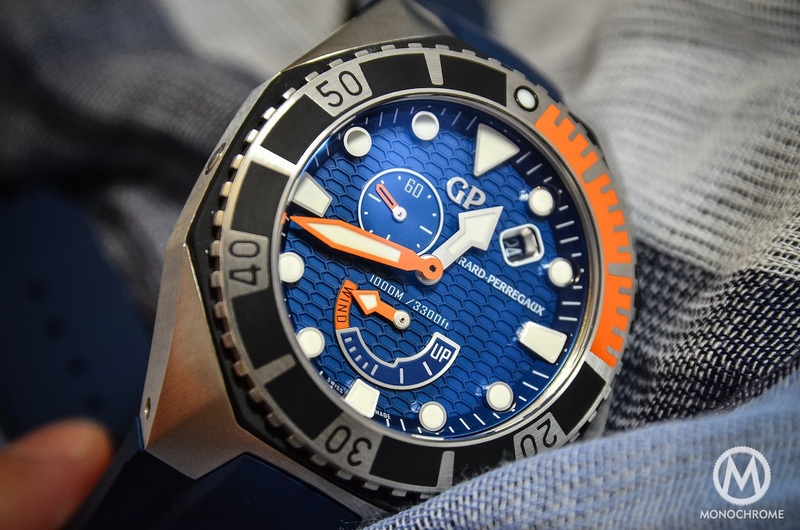 Below the hours/minutes sub dial is the winding/setting indicator, also in flame-blued steel, that tells the wearer if he can set the hour/minute hands or if it is set for winding. 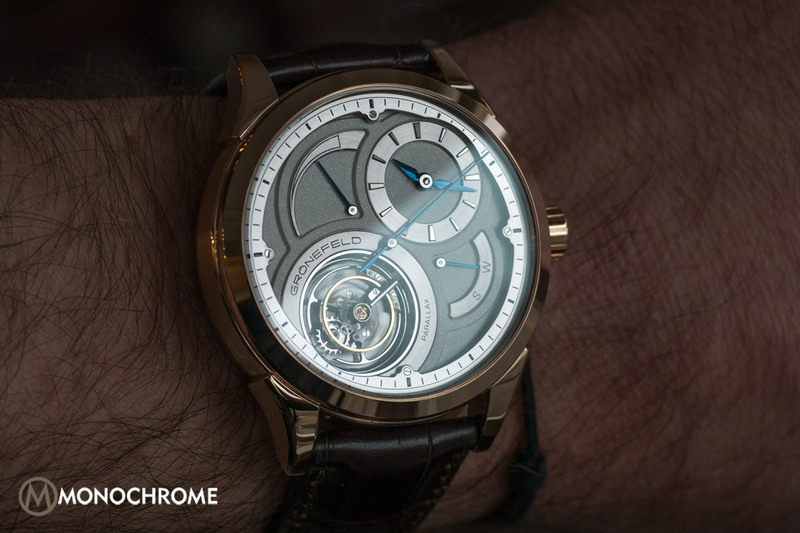 When wearing, the watch should be set for winding. As soon as the crown is pushed (it is a push-only crown), and the watch is in ‘Setting’ position, the seconds-stop mechanism is activated. 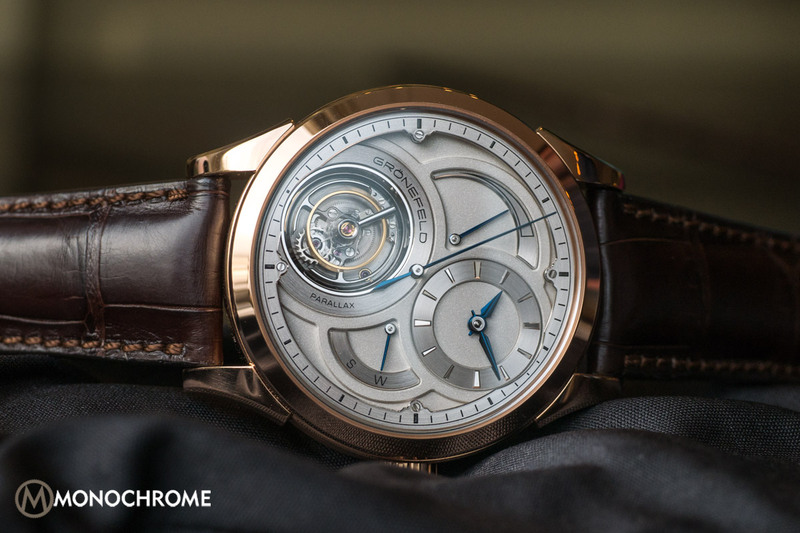 Both the flying tourbillon and the central second hand, which run perfectly in sync, continue their rotation until they arrive at the 12 o’clock position, and stop there. That’s when the time can be set, and when the crown is pushed again, the watch starts running again. The ability to set the time to the exact second makes the Parallax Tourbillon potentially more accurate then the vast majority of tourbillons on the market today. 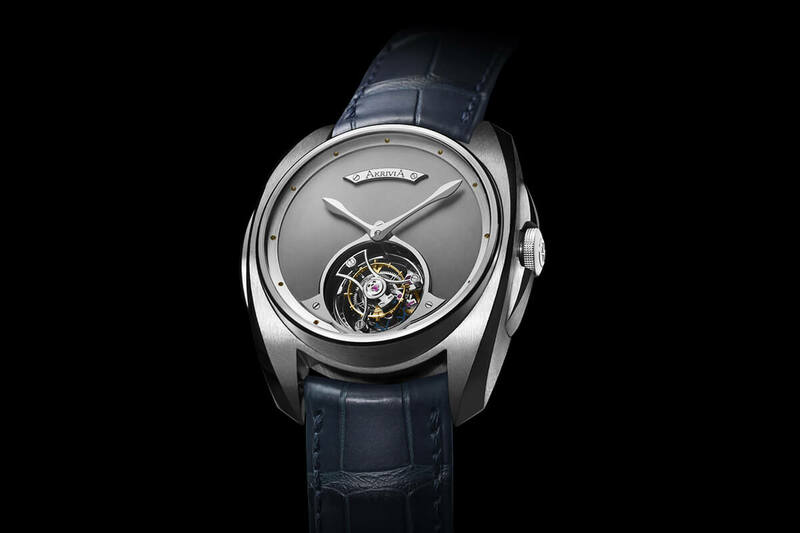 The Parallax Tourbillon features both a flying tourbillon that makes a full rotation in 60 seconds, and a large central seconds hand that does exactly the same, however offers much more precision when reading the time. Usually a central seconds hand requires a friction spring to prevent small fluttering caused by play in the gear train. This is construction is sub-optimal at best, because the friction spring takes away energy from the movement. 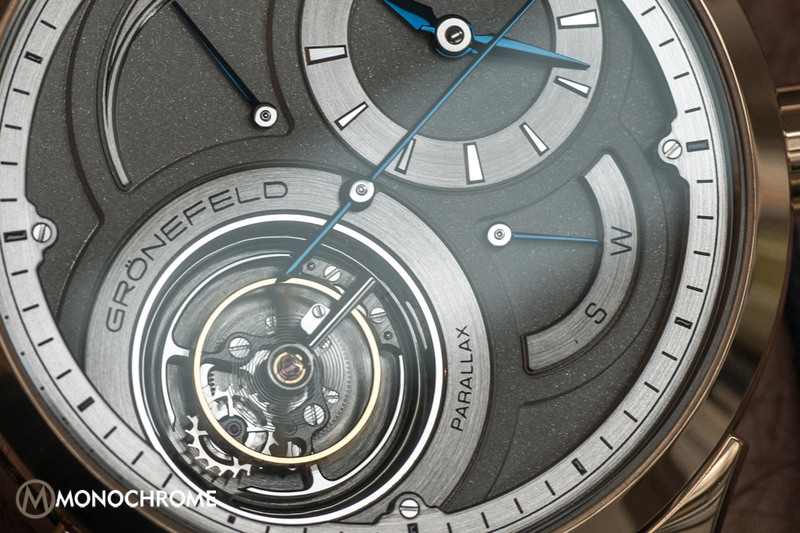 Grönefeld developed an added pinion that do not cost so much energy, and improves the power transfer to the tourbillon escapement. The name “Parallax” is derived from the precision of the readability of the central seconds hand. Parallax is defined as the apparent change in position of an object when the observer changes his own position. To minimize the possibility of error due to parallax when viewing the seconds hand from an angle, the hand is exceptionally close to the outer chapter ring with the seconds indexes. In a neat addition, the one-armed balance wheel bridge always runs parallel to the central seconds hand. Bart and Tim Grönefeld only use stainless steel bridges for their movements. Most watch brands use brass or German silver, both of which are softer materials and less durable compared to stainless steel. The metal absolutely gleams when polished to a mirror finish and as stainless steel does not oxidize, the gleaming finish lasts and lasts. There’s also a downside to the use of stainless steel for the bridges: polishing the hard metal takes a master watchmaker up to four times longer than more commonly used brass. 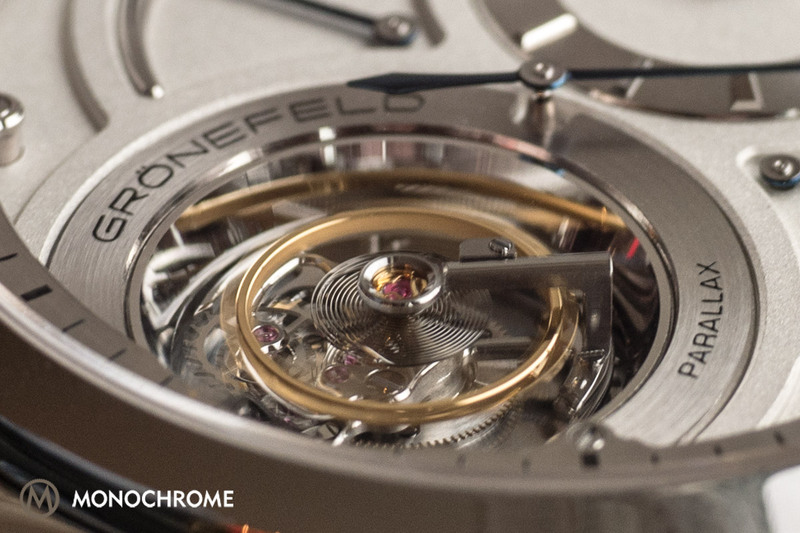 But the Grönefeld brothers feel that effort is well worthwhile and we here at Monochrome Watches really appreciate the visual effect! 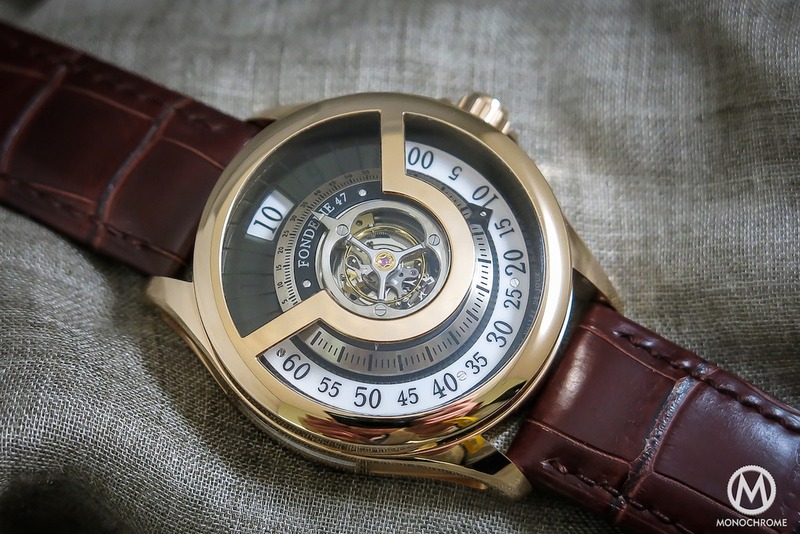 The Parallax Tourbillon is available in a red gold or stainless steel case 43mm case. Ensuring the exclusivity of this exceptional timepiece, the red gold model is a limited edition of 28 pieces and the stainless steel model is a limited edition of just 12 pieces. The red gold Parallax Tourbillon is available for € 137,450 Euro (before tax) and the stainless steel Parallax Tourbillon 1912 is priced at € 134,250 Euro (before tax).